Fun Things To Do With Kids: Attack of the Bloodsuckers! WHAT: Attack of the Bloodsuckers! A skin-crawling exhibit about ticks, leeches, mosquitoes, and other vampires of the natural world. Sponsored by DuPont with additional support from the Borkee-Hagley Foundation and Richards Paving. HOURS: Monday - Saturday, 9:30 a.m. to 4:30 p.m.; Sunday 12 - 4:30 p.m. ADMISSION: $7 adults, $6 seniors, $5 children (3-17), free for children 2 and younger. 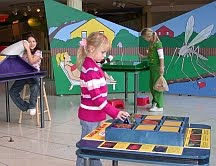 INFORMATION: Call 302-658-9111 or visit www.delmnh.org.